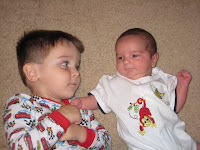 Here's an updated picture of my nephews Hal and Coleman. Coleman is getting big so fast! I agree with Grandmomma Earle, it looks like we have a Cottingham and a Posey!